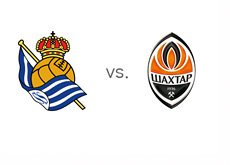 Real Sociedad are hosts to Shakhtar Donetsk in the first round of matches in the UEFA Champions League (UCL) - Group A. The match will be held on Tuesday, September 17th, 2013 at Anoeta - San Sebastian. Real Sociedad are flying high at the moment. They finished in fourth place in the Spanish La Liga last season and went on to eliminate Lyon in the UCL play-offs winning 4-0 on aggregate. This is the first time in 10 years that Real Sociedad get to play champions league football. Shakhtar Donetsk are regulars in the champions league these days. They won the Ukrainian Premier League last season with 13 points to spare and made it out of the UCL group featuring Juventus, Chelsea and Nordsjaelland. They were eliminated in the round of 16 by eventual finalists Borussia Dortmund 5-2 on aggregate. The hosts are the favourites to win on Tuesday. A 100 € bet on Real Sociedad could return 130 € in profit, while the same bet on Shakhtar Donetsk could return 225 € in profit. The most likely score, according to the odds is a 1-1 draw, offered at 5/1. Xabi Prieto is the favourite to score for Real Sociedad at 6/4 (bet 100 € for a chance to profit 150 €). Eduardo da Silva, the Croatian international, is the favourite to score for Shakhtar at 2/1 (bet 100 € for a chance to profit 200 €). This should be a good game! The other two teams in Group A are Manchester United an Bayer Leverkusen.